Our child sees something beloved in the trash or St. Vincent de Paul giveaway bag. This post at Faith and Family Live, Confessions of an Imperfect Mom: De-Cluttering Motherhood and Hoarding Faith, by Karen Edmisten, is nice read and puts into perspective how we shouldn’t define our parenting by our imperfections. And, if you don’t read Faith and Family Live. You should. I was picking up toys in Lillian’s room and came across this. The Princess and her reptiles. 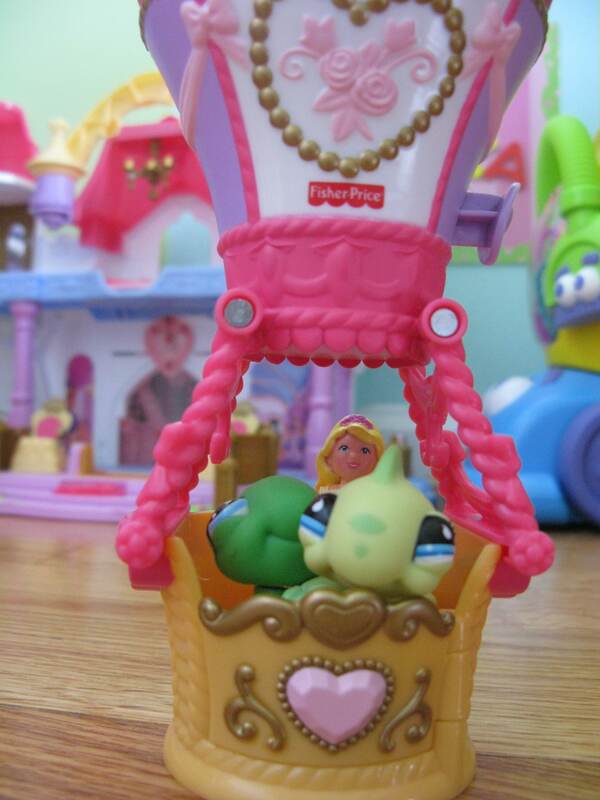 A princess in an air balloon with a frog and lizard, positioned just so in the midst of her well-appointed menagerie. Lillian lives in a remarkable place. Her feet may be on the ground, but her imagination takes her far, far away. She loves little toys. The greater choking hazard, apparently the better. I love when I open a lower cabinet and find her Littlest Petshop toys positioned in a private conversational circle. Or balanced just so on the base of a lamp or top of a heat vent. Those little surprises make me yearn for those moments myself. The freedom to let my mind take me somewhere. Sometimes anywhere but where my feet may actually be. Just to escape. But come back, of course. Moments like that make me grateful for prayer … and the promises of one day living forever in another remarkable place. Until then, I need to go dress my darling girl in her princess-the-pencil clothes. (Aka Princess Rapunzel). 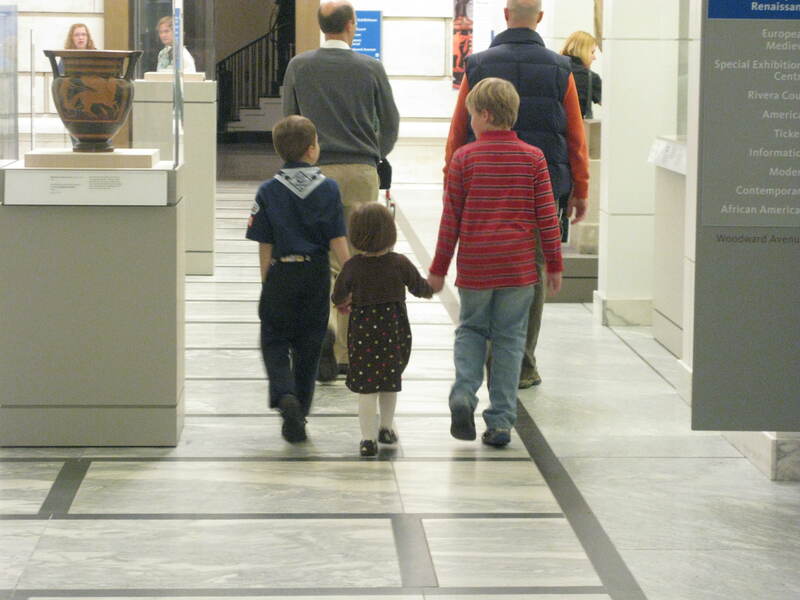 I captured this moment on a recent trip to the art museum. The best part is, it’s not an unusual moment. I get glimpses of the man my son is growing into as I watch him embrace his role as big brother and protector. Henry and a friend look after Lillian. I had the opportunity to have a date night with our eight-year-old son. I took him to the movies to see The Blind Side. The movie is rated PG-13, but I’d already screened it and thought it would be good for Henry. Although some of the material is mature, it is presented in a way that doesn’t seem gratuitous. The story has so many lessons. Even the elements that might be beyond him are wrought with opportunities for explanation. And I wanted the explanations to come from me. At this point of his life, I still want to be his filter. He has plenty of time to sort the stuff of life out, but for now, I want to provide him with the guidance he needs to understand our family’s values. As his parents, we are after all his first teachers. When he’s older he’ll take what we’ve taught him, weigh it with what he experiences, along with what our culture tells him is so, and have to figure out what is right and what is wrong, what is truth and what is not. I hope he remembers some of what we talked about tonight. Even if he doesn’t remember that specifically, maybe he’ll remember that he held my hand as we skipped to the car and that we returned home well past his bedtime on our special night together. And maybe that alone will be enough of a lesson. Sunday we made a trip to the Henry Ford Museum in Dearborn . We’re frequent visitors and have been members of the museum and village for 17 years. If you don’t go, you should. But that’s another post. They had a special “exhibit” of Lego castle stuff. I put exhibit in those annoying ironic quotes because it was hardly an exhibit. I think my expectations (as well as many others’) were that the exhibit was going to be something it wasn’t. We’ve all seen some of those amazing Lego creations on the internet. Heck, we saw some amazing youth-built Lego creations at the State Fair. That’s not what this exhibit was, but it’s hard to market something with the caveat that says, “Oh, by the way, it’s not at all what you think it is going to be, but come anyway and feel duped.” Anyway, I hope that the thing brought more people to the museum, because that place is always worth the trip. Back to Lego Land … at one area of the room there were multiple tables set up for kids to build their own Lego creations. Each table was flanked with bins of the building blocks in all shapes and sizes. Around each table stood many very busy children. And here’s a description that some might not like … most of them were boys. (That’s just a reality check and shouldn’t surprise any parent of a boy.) Yes there are some girls who totally get into Legos. But the fact of today’s visit is that those tables were surrounded with more serious boys than girls. The girls were good for a while but the boys were there, in community, building. The table Henry was working at was all boys with the exception of one little girl. She was very busy and holding her own next to her older brother. There were at least a dozen or more boys at this one spot, and together they formed a sort of Utopian Lego Nation. Peacefully working together. “Dudes, anyone see this shape?” A bigger boy asked holding up a piece. Searching for treasure, little boy hands dug deep into the trenches of the closest H1N1 infested bin to find that prized piece. Each eager to take part in contributing to that big boy’s vision. Success. Then back to work. They casually shared stories of their design. Its function. Its form. All standing, quietly building. There was agreement, encouragement and many approving nods as they looked about. All I could do stand back and admire the comfortable comradery among total strangers — all focused, working with a purpose. When the boy next to Henry was having difficulty figuring out how to fit a piece a certain way, Henry reached over, put his hand on top of the boy’s hand and showed him how to turn the piece to get the desired positioning. A brief smile of thanks from the boy, and they were back to work. I felt like I had witnessed a little glimpse of heaven and was just short of tears. For a brief sweet moment, I just imagined what the world would be like if it were run by these generous little boys. When I repeated it he squealed with delight and said it again and again. He was in da da heaven. Since he’s not been much of a babbler, it was a nice surprise. It was so deliberate. He’s nine-months on Friday. Blink. Where did that time go? Just like that — from swaddled baby to full-fledged communicator. Lillian, on the other hand, announced that if I didn’t give her pop with lunch not only would she not eat her lunch, and she would never be nice again. So much for my maternal yearning for communication skills. Needless to say, she did not eat her lunch (yet, it’s still sitting there) and the verdict is still out on the nice thing. I think she’s already forgotten about that threat. The funny thing is, we don’t even have any pop in the house. Now she’ll be eating rubbery, twice-warmed tortillas because of her very deliberate communication. All I can say is: da da. Or duh, duh … eat your cheesy roll-up. I loved this article at Faith and Family Live. Enjoy.